Note: This post was written previously and has been updated with new information. You may (or may not) know that you can automatically send comments left on your website to the spam list if they contain certain words. I have been maintaining a list of words that I have gathered over the years and been sharing that with my private coaching clients. You can download the file and simply paste all the words in the Comment Blacklist area (Log into your WordPress Dashboard, go to Settings, then Discussion, and then to the Comment Blacklist area). If that seems like too much work, there is actually a plugin that will do this for you! This plugin will check the global comment blacklist on GitHub multiple times a day. Whenever new anti-spam values have been added to the global list, Blacklist Updater will read the global list and update your WordPress database accordingly. While the check-up process will run several times a day, the plugin will only update the database when it detects an actual change of the global comment blacklist on GitHub. And right now, I am off to go check out how good that plugin is! I will let you know what I find out! Hey Paul, thanks for mentioning my blacklist project. I’d appreciate any feedback you might have. By the way, I’ve been using Sergej Müller’s Blacklist Updater plugin on a couple of my sites for the past six months … it’s a super simple “no muss, no fuss” solution to keep things up to date. The thanks go to you, Grant! Thank you for doing what you do. I have not yet had a chance to check out Sergej Müller’s Blacklist Updater plugin, and it is on my list to do so! By the way, as of this afternoon the latest blacklist contains over 14,000 keywords and phrases. Just a warning to some folks – your niche may require some of the words/phrase that could be in this list! Review just in case! For example, a Mommy blogger site that talks about child birth, or a med student site discussing anatomy, etc. Actually, I’d love to hear from people regarding specific words or phrases I’ve included on the list that may be valid in some cases. Thanks Paul! This is great information and I can’t wait to take a look at that plugin. I am so tired of having to manually go into my site to delete ALL those Spam comments. When I hear back from the developers, I will post my findings here! Thanks, Debbie! I fear some folks use those words when they use translators from their native language, so I don’t use those ‘aids’. My spamcatcher performs superbly (all spam is quarantined, ready for easy ‘trash’ disposal)- with one exception (perhaps)- yahoo.com addresses are always quarantined. Maybe the yahoo addresses should be quarantined 🙂 WHich tool do you use for your spamcatcher, Roy? Alas, I have a blogger blog. And I am so tired of the spam, I do think of giving up my blog sometimes. Life is too short. Just fight the spammers with automation! At least that will whittle it down. Thanks Paul and Grant Hutchinson. I used to get a boat load of spam comments, but I’ve been using Sitelock to monitor my sites for just under a year, and no longer get any. Hurrah! 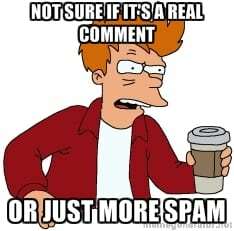 I got quite a few spam comments but they all go to my spam folder where I can check them. I have found a few that go there from my regular viewers so I like to check to be sure. I’ll check into the plugin!